Urban fauna: faunistic, zoogeographical and ecological problems. Phytosociological classification of habitats of the fauna of Warsaw surroundings. Methods for the study of urban fauna. Enchytradeides (Oligochaeta, Enchytraeidae) of Warsaw and Mazovia. Earthworms (Oligochaeta, Lumbicidae) of Warsaw and Mazovia. 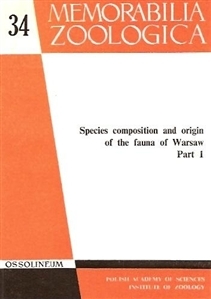 Isopods (Isopoda) of Warsaw and Mazovia. Spidera (Arachoidea, Aranei) of Warsaw and Mazovia. Harvestmen (Arachnoidea, Opiliones) of Warsaw and Mazovia. Carabids (Coleoptera, Carabidae) of Warsaw and Mazovia. Scarabaeides (Coleoptera, Scarabaeidae) of Warsaw and Mazovia. Click beetles (Coleoptera, Elateridae) of Warsaw and Mazovia. Coccinelids (Coleoptera, Coccinellidae) of Warsaw and Mazovia. Longicorns (Coleoptera, Cerambycidae) of Warsaw and Mazovia. Chrysomelids (Coleoptera, Chrysomelidae) of Warsaw and Mazovia. Curculionides (Coleoptera, Curculionidae) of Warsaw and Mazovia.